Sen. Shane Massey held a “town hall” meeting in the Edgefield County Council chambers on Thursday, March 7, 2013, 6:00 p.m.-7:30 p.m.
Sen. Massey provided an update on the 2013 legislative session and answered questions from constituents. The meeting began with a discussion of the need for additional highway funding. Senator Massey heard pros and cons from constituents of raising the gas tax to fund the necessary repairs and maintenance to infrastructure. Next, Senator Massey talked about the change in the Senate’s environment this year, with the election of ten new members to the body. According to Sen. Massy, the first female Senator, Katrina Shealy from Lexington, is a welcome addition. He also, said the new Senators are much more outspoken than in past years. 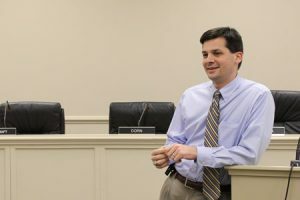 Overall, “The changes are for the better and the Senate is much more cordial this year,” said Massey. The Senate’s first order of business this session, after approving their rules for the year, was to address election laws that caused many candidates to be removed from the ballot in the run up to last year’s general election. Massey was proud of the work the Senate did on their bill and is anticipating the House wrapping up their version soon. He expects there will be differences in each chamber’s bill that will be worked out in a conference committee before heading to Governor Haley for her signature. Massey also offered details of the debate over the State’s approximately $6.9 Billion budget. Spending for K-12 Education is the largest line item in the budget followed by Medicaid funding. There is much debate over how the state will respond to requirements and provisions of the new Federal healthcare law. Medicaid expansion and the setting up of an insurance exchange are currently being debated. Other items discussed included continued efforts to restructure state government by creating a Department of Administration; the need for increased legislative oversight of state agencies; a proposed constitutional amendment to allow the Governor to appoint the Secretary of Education; another proposed amendment to legalize raffles conducted by non-profits.